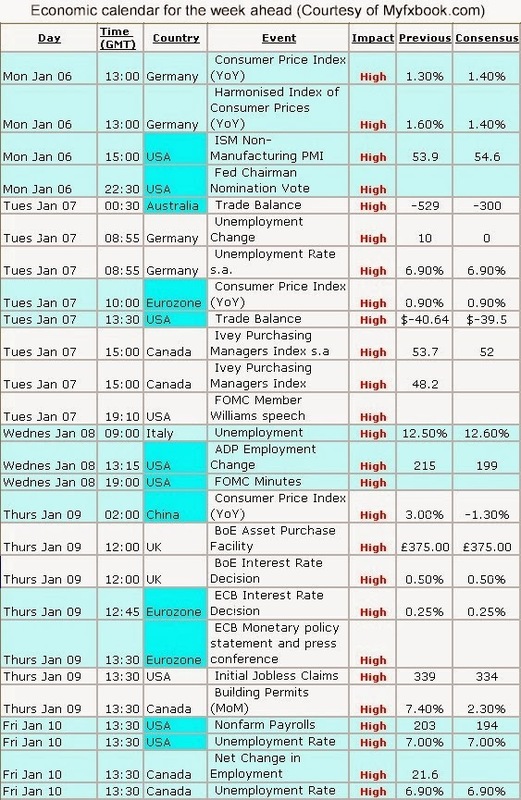 OmiCronFX : An interesting week ahead for Foreign Exchange | The major Central Banks and their policies. An interesting week ahead for Foreign Exchange | The major Central Banks and their policies. Welcome back to the OmiCronFX commentary on the first full week of the New Year of 2014. We run a market neutral operation here, which means that our strategy involves never attempting to predict the direction of the currency pairs in which we trade. Instead, our systems react to price action that is apparent at the present time, combined with our assessment of the probabilities. As a result of this, we do not attempt to predict the future. However, timing is also important, because this gives us advance notice of when we need to be even more focused than usual on the markets, and timing is dependent on the major market moving events that take place. They are, to a large extent, scheduled in advance but we also have to be ready for surprises, the well-known “Black Swan” events that occur out of the blue. It is the job of our money management and risk control measures to cater for these. This week’s economic calendar includes a number of items with high impact possibilities. Later in the global day today, Monday January 6, the US Senate will vote on the appointment of Ms. Janet Yellen to replace Ben Bernanke as Chair of the Federal Reserve. This vote is expected to pass, and if and when it does Ms. Yellen will take up her post on February 1st. next. Tomorrow sees the publication of the Australian Balance of Trade figures, which is the difference between imports and exports for our friends Down Under. This is much watched in Oz, more so than in other jurisdictions, and it has been moving in a direction in recent times that is not to the liking of the authorities. Also tomorrow we will have inflation figures in the Eurozone. It was low inflation that allowed the ECB to reduce its target interest rate in November, to the surprise of many, so any further decline will be of interest this time around. Then, on Wednesday, there is the ADP employment report. This is carried out by a private company but it often provides a leading indicator of the outcome of the official, and market-critical, Non-Farm Payrolls report, which comes out on Friday (It is normally on the first Friday of each month, but is on the second Friday on this occasion due to the recent holiday period). Thursday has the ECB monthly interest rate decision, monetary policy statement and following press conference. All in all, a busy week to kick off the New Year. The major Central Banks and their policies. Obviously, the known policies and, in particular, the manner in which they are implemented by the various central banks are of supreme interest to us. It would be forgivable to think that policy is always about the value of the currency for which any given central bank is responsible. This is often true, but is not always the most pressing concern. The European Central Bank (ECB), for example, is committed to control of inflation and in this regard the value of the Euro on the world stage might have to take second place in their considerations from time to time. The Federal Reserve in the US has been carrying out a policy of Quantitative Easing for some time now, and this, of course, affects the US dollar. While the primary goal of QE is to simulate the economy, the fact that it weakens the greenback at the same time is probably welcomed by the US authorities, as they then get to pay back their massive foreign debt using devalued currency. Right now, both Australia and Japan are, indeed, primarily concerned with reducing the value of their currencies, as they are perceived to be too high to sustain the exports that those countries depend on for their prosperity. So different monetary authorities can have different priorities. There is one thing they all have in common, however: This is a profound dislike of volatility in the markets. It is for this reason that all major institutions that have responsibility for monetary policy are now committed to giving what they call Forward Guidance. They will go to great lengths to avoid surprises in the market place. The good news for those of us that need a certain amount of volatility, in order to be able to trade, is that the central banks, just like everyone else, do not have the ability to foretell the future.